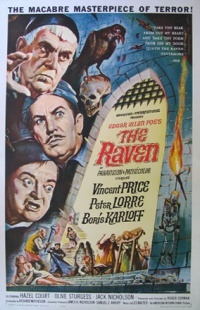 In 1963, Roger Corman directed The Raven, a horror-comedy written by Richard Matheson very loosely based on the poem, "The Raven" by Edgar Allan Poe. It stars Vincent Price, Peter Lorre, and Boris Karloff as a trio of rival sorcerers. Hollywood is practicaly metonymous with the Cinema of the United States. 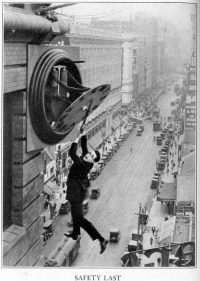 This was perhaps different in the Pre-Code era, and certainly different after the 1948 Hollywood Antitrust Case led to the break-up of the Hollywood studio system and the development of arthouse and grindhouse movie theatres. Unless indicated otherwise, the text in this article is either based on Wikipedia article "Cinema of the United States" or another language Wikipedia page thereof used under the terms of the GNU Free Documentation License; or on original research by Jahsonic and friends. See Art and Popular Culture's copyright notice. This page was last modified 08:19, 2 February 2019. This page has been accessed 15,569 times.